If your XPmonNT window did not fill up and display all of the servers, try this. 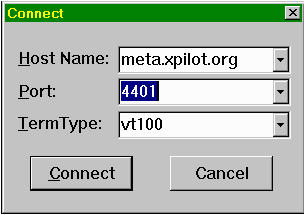 Enter meta.xpilot.org for the host name. Enter 4401 for the port number. Your screen should fill up with lots of normal text that, while being completely legible, is tedious. Then you will get a "Disconnect" message box. If this procedure works and XPmonNT still does not function, write me at the address below and maybe we can work it out. You are trying to run from behind a company firewall that won't allow you to use this port. If this is the case, you have probably already run into other Internet applications that fail as well. One user could not function using the "Turnpike" Winsock. Microsoft finally has a standard TCP/IP Winsock available for all of their (things they call) Operating Systems. Use it.